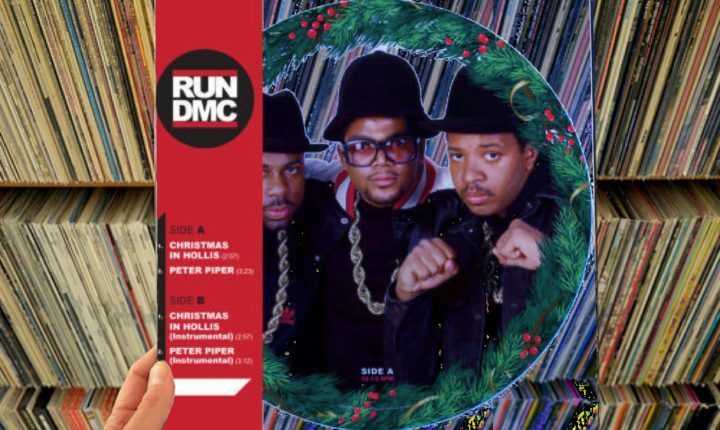 A deeper look at the grooves pressed into the “Christmas In Hollis” 12″ Picture Disc single coming out on Black Friday 2016 from Run-D.M.C. I must confess that I have never been a fan of Christmas carols and Christmas songs. While I understand the idea of having a song in one’s heart around the holiday season, I’ve always thought that the idea of professional musicians recording albums of the same standards with their own small creative stamp on them pretty trite. Hearing Kenny Rogers or John Denver or Nana Mouskouri or Celine Dion regurgitating a set of the same standards along with one or two passably competent originals to add a bit of “unique spice” to the mix just doesn’t do it for me. What does pique my interest is when an artist records a song which reflects their personality as well as expressing an affection for the holiday season into a song that’s all their own; those songs are rare and great. That’s why I’ve always loved Run-D.M.C.’s “Christmas In Hollis” – it expresses a genuine love of the season and couldn’t have been made by anyone other than Run-D.M.C. It’s impossible to beat that. In keeping with the spirit of the song, the new, Black Friday/Record Store Day 12” “Christmas In Hollis” single is special for several reasons: first, the song is pressed into a picture disc format and features a classic photo featuring Jason “Jam Master Jay” Mizell, Darryl “DMC” McDaniels and Joseph “Run” Simmons taken at the height of their career, second, the A-side also features “Peter Piper” – a great single from the group’s third album, Raising Hell – and, finally, the B-side (which features the image of the Run-D.M.C. logo to counter the photo on the A-side) of the single features instrumental versions of both songs. As they play, those who go from front to back with the single will find that each song further enhances the experience rather than just feeling like an assembled collection of four songs; the beats and rhythm lock together tightly, as does the overall vibe of the production which is surprising because the songs were not recorded in the same sessions, were not originally released in the same year and did not originally appear on the same album. Simply said, the overall vibe and personality of the songs is what holds this single together, and it’s so consistent that the listening experience feels great through both the A- and B-sides. The “Christmas In Hollis” 12” Picture Disc Single will be released on Black Friday, November 25, 2016. Find your copy at your local independent record store! A list of participating stores can be found here.